The United Nations’ Sustainable Development Goals (SDGs) were established in 2015 as a global framework for addressing the world’s most urgent social and environmental challenges. Private capital—particularly in emerging markets—has a critical role to play in ensuring successful delivery of the SDGs as investors providing patient and actively managed funding have the ability to drive change at scale and speed. With the United Nations estimating that achieving the SDGs in emerging markets will require investment of US$3.9 trillion per year, and assumptions based on current commitment levels and private sector participation leave an estimated financing gap of US$2.5 trillion annually, the resources and expertise of the private sector, including the rapidly growing number of impact investors, will be key to addressing this need. The SDGs are increasingly in focus as both a responsibility and opportunity as investors are seeking not only environmental and social impact but also value creation opportunities that will generate strong financial returns. Fund managers and institutional investors alike are employing more rigorous approaches to measuring, evaluating and defining their impact with the understanding that we must be able to measure and link impactful outcomes to significant commercial results. As the sustainable investment community continues to grow and evolve, this event brings together industry stakeholders to share best practices and address key concerns. Our industry-leading speakers and panellists will draw on personal experience and business case studies, identifying ongoing challenges and outlining solutions. The agenda also offers the opportunity for attendees to join roundtable discussions focussing on key SDGs toward which private capital can play an outsized role in generating impact, such as healthcare, renewable energy, food production, education and gender. 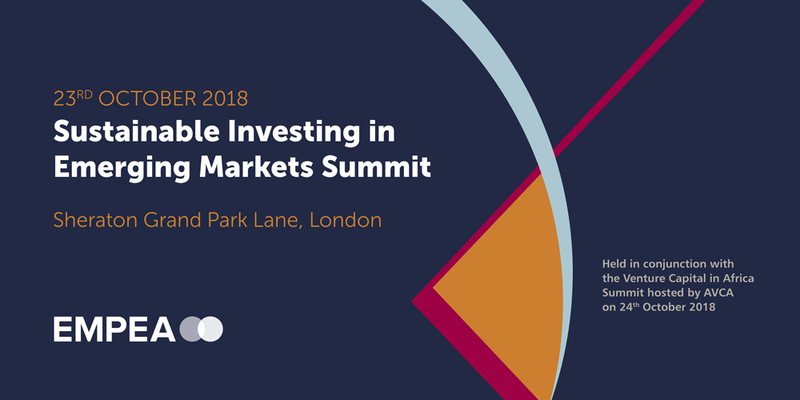 The Summit will draw on the knowledge and expertise of actors across the private capital spectrum, including large-scale asset allocators, family offices, foundations, endowments, development finance institutions, sovereign wealth funds and fund managers, as well as government representatives and environmental, social and governance (ESG) and sustainability business leaders and advisors. Our attendees will aim to define the financial and social implications of sustainable and impact investing in emerging markets, with a focus on how to best pursue the SDGs and create value. We invite you to join this dialogue. The EMPEA Institute will also once again present the popular Sustainability and Operational Excellence Challenge. The top three fund manager finalists from the Challenge will present case studies of portfolio company investments that demonstrate outstanding sustainable impact from an operational, environmental, social and governance perspective. Members of the audience will vote on the winner of the Challenge, who will be announced live at the Summit.